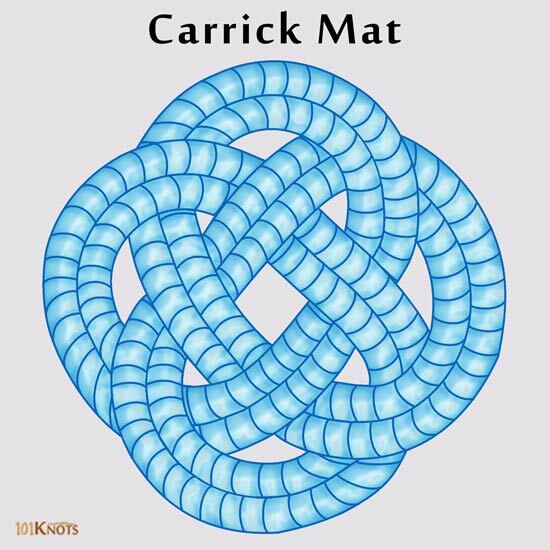 The Carrick bend mat, thump mat or the more popular Carrick mat owes its name to the Carrick bend due to its resemblance with the latter. 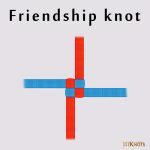 When tied with paracord or thick ropes, the decorative knot serves the purpose of a hot pad or a table mat aesthetically. With the ends connected together, it takes the form of an endless knot that has a great spiritual value in some religions for its interwoven structure. Being a classic Turk’s head weave, it is related to the Turk’s head knot. 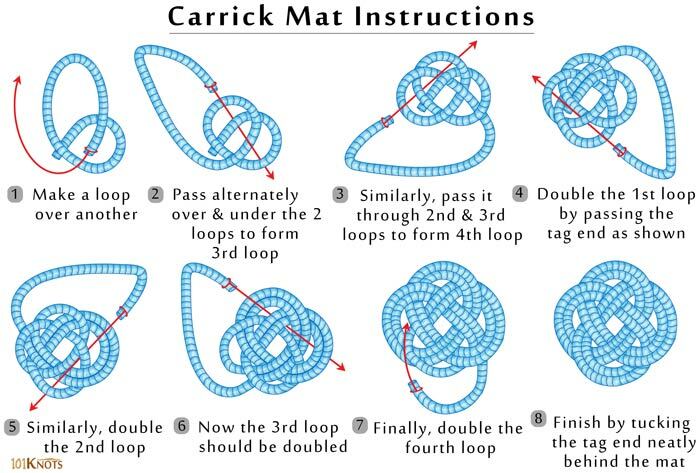 The diagram shows the tying instructions of a small version of the mat. It can be made with 2 (as illustrated) or more strands of rope. 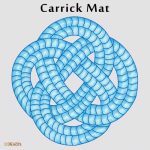 Cotton ropes or Manila hemp make attractive Carrick bend mats. You may sew or glue the ends or bind them with a constrictor knot and then whip neatly for greater security. Traditionally used to prevent chafing by sailors who place it around a ring bolt on the deck. It also minimizes the sounds of falling cargo blocks and protects the deck from wear and tear. Taking advantage of the larger patterns out of the various designs of the mat as depicted in the Ashley Book of Knots, you can make elaborate chair covers and stair treads.